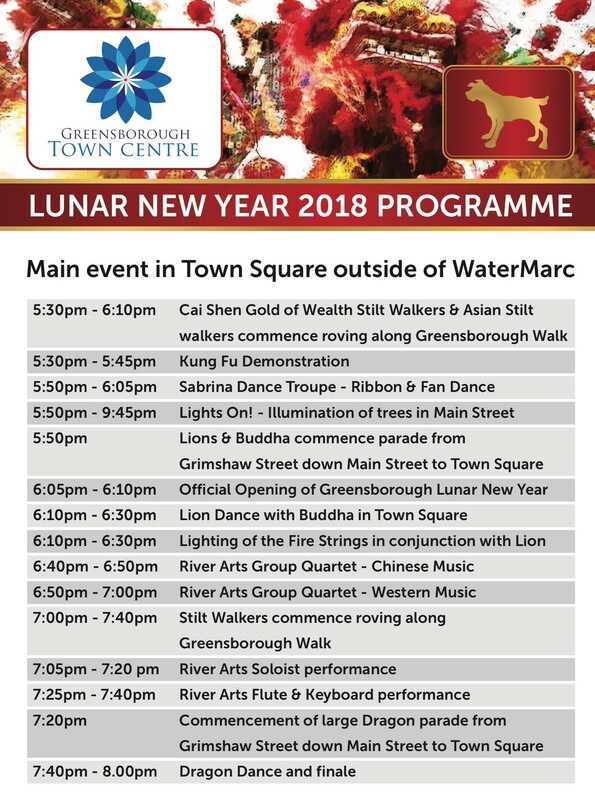 Lunar New Year event will be held on Friday 23rd February from 5.30pm to 8.00pm throughout Greensborough. There will be wandering entertainment in restaurants in Greensborough including dining precinct in Greensborough Plaza and outside of WaterMarc. The main event will be held outside of WaterMarc. You will be amazed with the various entertainment such as a Lion Dance Troupe with three lions, one of the largest Dragon + Buddha, Kung Fu Exhibition, Chinese Traditional Band Quartet, Stilt Walker – Cai Shen, God of wealth, 2 Chinese Empress Character Stilt Walkers, Asian Balloon Artist and Face Painter , Ribbon & Fan Dancers, Dragon rides for Children, Colourful Gizmo roving the Strip and Greensborough Plaza Dining. Our lovely roving hostesses in Asian dress will be giving away 2,000 Fortune Cookies and fans to keep you cool. There will also be the lighting of the traditional fire strings to ward away evil and bring good luck for the following year.